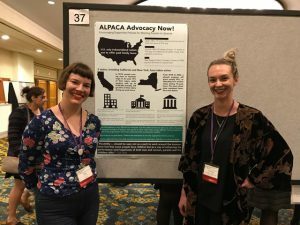 The following is a summary of a poster presentation [poster can be viewed here: ALPACA Advocacy Now!] given at ARLIS/NA 2017, written by ALPACA members Cathryn Copper (Librarian, Woodbury University School of Architecture, San Diego, CA) and Kim Loconto (Formerly Brooklyn Museum Libraries and Archives, New York, NY) . At the 45th Annual ARLIS/NA Conference in New Orleans, LA three ALPACA SIG members, Cathryn Copper, Elizabeth Lane, and Kim Loconto, presented a poster on advocacy for working parents in libraries. The poster supported the SIG’s mission to “promote dialogue, support, and advocacy pertaining to balancing an art librarian career with being a parent or caregiver.” It examined family friendly benefits internationally, nationally, and at the institutional level. In January 2017, the poster presenters created a survey to gather data on institutional policies and supportive practices. The survey was sent out to the ARLIS/NA listserv and posted to the Academic Librarian Parents Discussion Group on Facebook. It received a total of 56 responses. 22 respondents work in museum libraries, 18 respondents work for a public university or college, 13 respondents work for a private university or college, and 3 respondents identified their institutions as other (Library of Congress, special library, and library vendor). The survey sought to analyze size and type of institution in relationship to the type of benefits they provided to working parents and how supported parents felt at their institutions. 39 respondents identified themselves as parents of children between the ages of “in womb” to 35 years old. The data showed that private universities or colleges with 150 or more employees offered the most substantial benefits to working parents. These benefits include: paid leave, short term disability leave, flexible scheduling, breast pumping facilities, on-site childcare, and/or a childcare stipend. Institutions with less than 50 employees offered the least amount of benefits across institution type. Furthermore, the survey showed that museum libraries offered the most flexible scheduling. Respondents across institution type agreed that the more flexible scheduling options that were provided the easier it was for them balance work life and family life. However, only one third of museum librarians, despite the likelihood of flexible scheduling, said that their institutions were supportive of new parents. In general, institutions that offer paid family leave were viewed as the most supportive of new parents. Roughly 42% of respondents said that their institution was supportive of new parents, and 33% opted for the “other” category, responding neither yes nor no to the question, but provided comments. Comments focused on the fact that supportiveness was dependent on the supervisor and usually did not expand to administration. Nevertheless, 72% of respondents said that they felt at least somewhat comfortable voicing their opinions and concerns on the topic to management. Despite the lack of support and demanding schedule that the discipline affords working parents, the openness librarians feel to approach management is a positive aspect. In order to move any policies and practices forward, working parents will need the help of management. It is imperative that we utilize the open communication that we are provided to push the profession in a more supportive direction. The poster presentation was a step forward in bringing awareness to the issues working parents face. Without a formal counting mechanism, we estimate the poster was visited by about 30 professionals. Parents, expecting parents, and non-parents visited the poster and offered support. There was a lot of meaningful discussion of and interest in the research and statistics presented. Mostly poster viewers were thankful that the information was available in the public realm for debate and progress. Reach out to your local representatives! Share your experiences with Fairygodboss: Jobs and Employer Reviews for Women, By Women. Have a flexible workplace expert visit your institution. Copyright © 2019 ALPACA ARLIS/NA. Powered by WordPress and Stargazer.